Looking for a place not too far off the interstate on our way to the Florida Panhandle (30-A) for Mrs. Pie’s and my annual beach vacation, the Snob selected a relatively new joint on the outskirts of Montgomery called Capone’s Pizza & Subs. 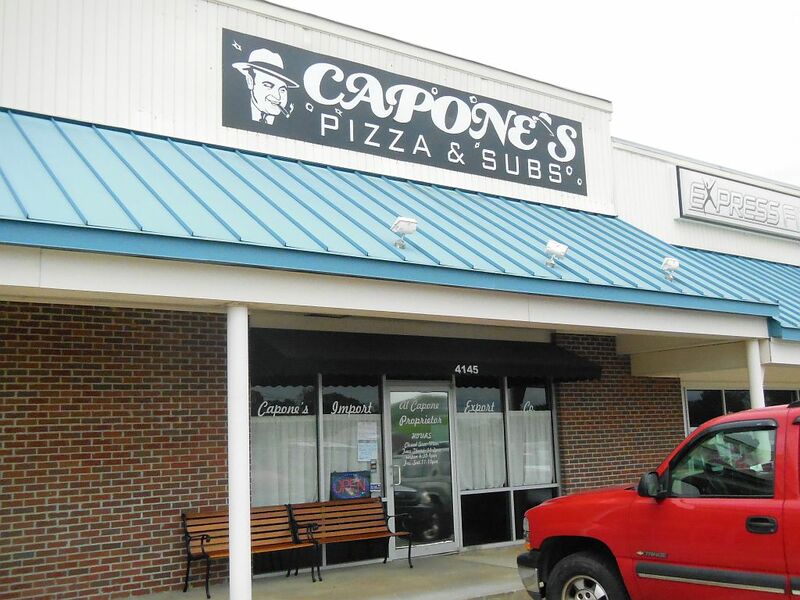 Capone’s is only three miles east of I-65 just north of Montgomery in the town of Millbrook.The Snob originally disliked its name having an aversion towards naming a pizza joint after a dated, notorious character. But, they easily won m e over by making their pie look incredibly appetizing on their website. 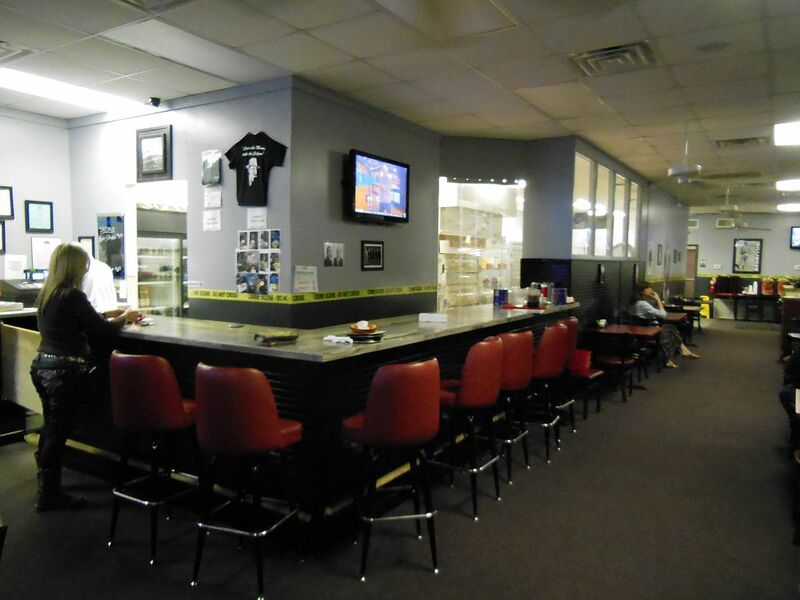 Capone’s is located in a modest strip center on the main road off the Interstate. 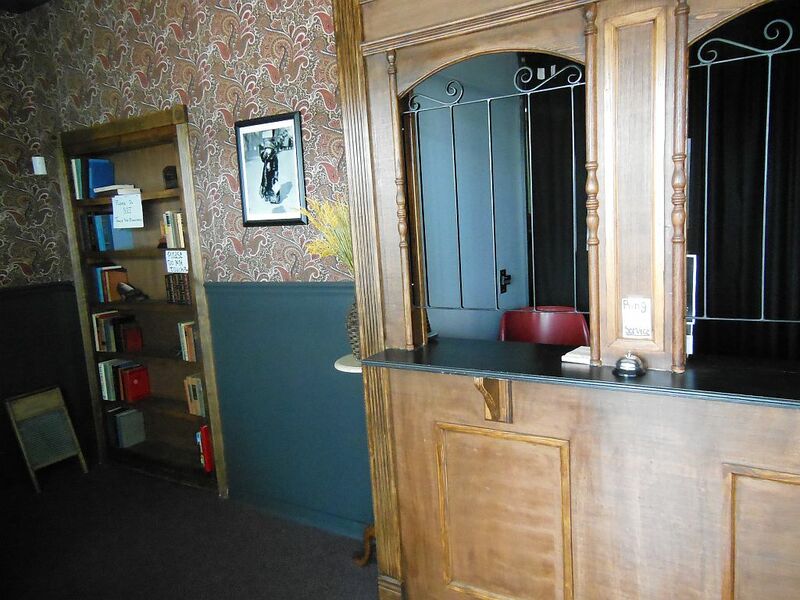 We entered through the front door into a small, closed-off room that had a bookcase and an old wooden ticket booth displaying a “Ring for Service” sign. For a split-second I thought this was a take-out only place. Owner Bill shortly emerged asking us for the password to get into his “speakeasy.” After a bit of prompting, we figured it out, and he pressed a button opening the secret entrance. Way cool! Inside, we found a fairly normal-looking pizza joint, albeit one whimsically decorated with mob-related photos and posters. Bill seated us and told us that our pre-ordered pie was almost ready. In the meantime we ordered some salads and further checked out the joint. Like its name suggests, Capone’s specializes in pizza and subs, but also offers salads, calzones, pasta, and Italian deserts. Our salads were great, and the pizza arrived soon enough looking deliciously thin, crisp, and hot. 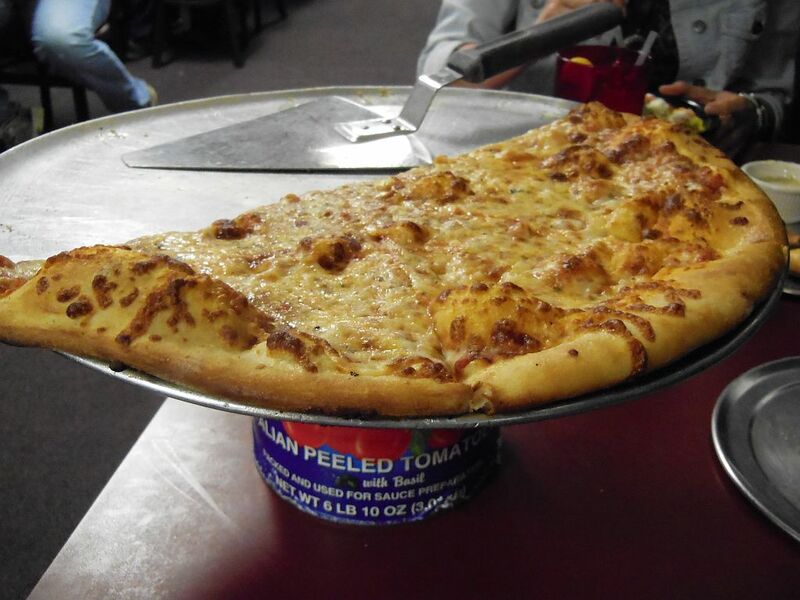 It was fittingly placed atop a large tomato sauce can that served as a platform. This was an authentic, hand-tossed pie that was perfectly cooked evidenced by its irregular shape and pizza bubbles. Capone’s pie was awesome from the first bite, and the basics were all there. The crust was crunchy and chewy, and the tomato sauce and cheese were perfectly balanced. It was seasoned delightfully with a soft touch of oregano and a tender coating of olive oil which enhanced its flavor. We finished the entire pie to the surprise of our waitress who thought we’d be taking some of it to go with us. I highly recommend that if you take a holiday to the Redneck Riviera (aka the Florida Panhandle), or find yourself in Montgomery, Alabama, “looking for a safe place,” to stop at Capone’s for what may be the best, southern-most New York-style pie in the USA. I guess you got lucky that night. Yes the food is good. But it’s hot, noisy and the staff have no clue. When I go out for dinner I expect to get what I pay for. Good food, comfortable enjoyable and a staff that at have seen what the dish looks like. They closed down December of last year. I got lucky and ordered my first pizza from there earlier this year while they were helping a church with a fundraiser and were nice enough to let us order a couple pizzas at a discount. It was alright, but I prefer Papa Johns. So sorry to hear that–great place and a very nice owner. I wish him the best. Does anyone know Bill’s last name? Have location he may be interested in leasing.